This thread is simple! Rather than having a million little threads about everything that goes on at Worlds Of Fun, this thread is designed to consolidate it all into one user-friendly thread. Feel free to use it to post updates, trip reports, questions, comments, and of course, general discussion. For pictures and videos of the park as well as past updates, see TPR's Park Index Page. September 7th, 2005 - Patriot announced - SEE BELOW! January 26th, 2011 - Planet Snoopy expansion adds an eighth new ride, Sally's Swing Set! October 4th, 2011 - Half Pint Brawlers coming to Worlds of Fun! October 9th, 2011 - Halloween Haunt trip report posted! January 4th, 2018 - Timber Wolf gets an 70° over banked turn in 2018! 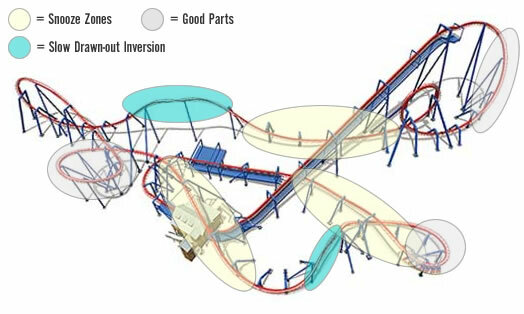 "Kinzel concluded by explaining that the Partnership plans to announce its 2006 capital plans for Worlds of Fun tomorrow, September 7. Capital expenditure plans at the Partnership’s other parks for next season are in the process of being finalized and will be announced over the next month or two." Such a happy day tomorrow! Last edited by jedimaster1227 on Thu Jan 04, 2018 12:35 pm. If I didn't know better, I'd say it was a clone of Talon.. heh. Does indeed look like Talon. I don't think is it a clone of talon, because if you look at these photos, they look different at the end. If the layout reminds me of anything it is Great Bear. Right down to the boring straight sections. something better than Silver Bullet. It is something more of a modified Talon layout, VERY closely modeled after Talon. Of which I see NO straight sections. So you must be looking at the wrong track. All the elements are the same except its a bit taller and they are angled differently. I think it looks a little boring. Don't get me wrong, it could be an insane/super-cool ride. I think the placement of a G&M invert helps it's status even more than the layout. Just think how weird Nemesis would look if you took it out of it's surroundings.